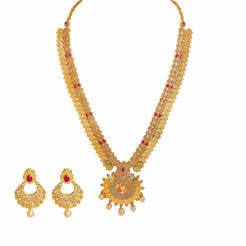 18K Multi Tone Gold Diamond Necklace and Earrings Set W/ VVS Diamonds, Emeralds, Drop Pearls & Hibiscus Pendants for women. This radiant gold diamond set is encrusted with 2.71ct VVS diamonds, precious emeralds and drop pearls. The necklace has faceted round details and is 16" long with a width range of 4-7 mm. Its Hibiscus flower pendant is 39 mm long and 17 mm wide. Each earring is 35 mm long and 14 mm wide. 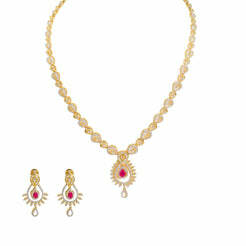 This decadent set has a total gold weight of 38.9 grams and can be worn as a statement set for any special event.